Introducing the new Kabuto block from Global. Made in Japan from the finest quality stainless steel, Global knives are lightweight and comfortable to hold. Ice-tempered and hardened, the blade holds a razor-sharp edge longer than any other steel and resists rust, stains and corrosion. Each knife is carefully weighted to ensure perfect balance in the hand and maximum cutting efficiency. Made in Japan from cromova 18 stainless steel. 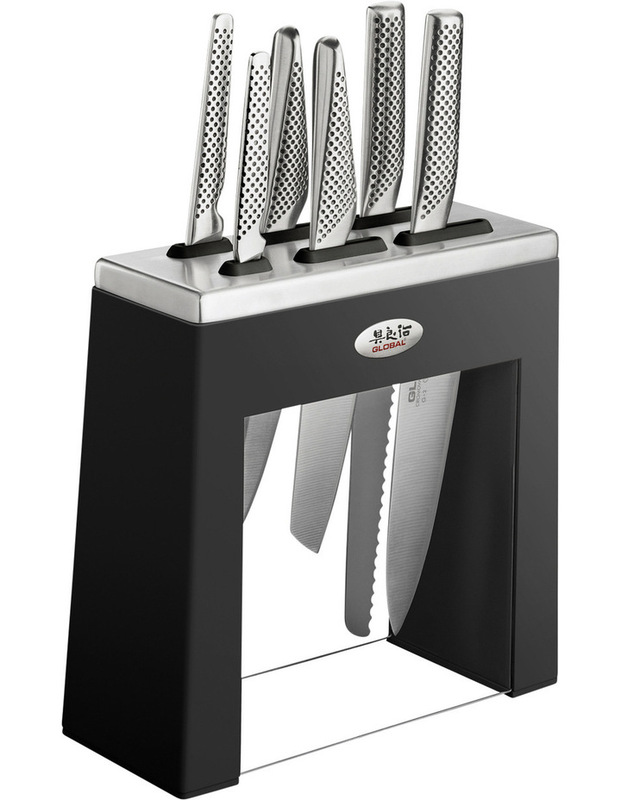 Set includes: 8cm Paring Knife, 11cm Utility Knife, 13cm Cooks Knife, 14cm Vegetable Knife, 20cm Cooks Knife, 22cm Bread Knife and black knife block.